In commonly mold designer know that Cooling conditions affect cycle time, part dimensions, surface finish, and warpage. 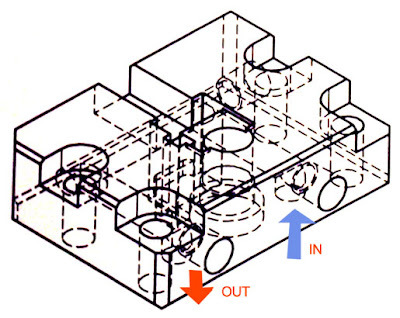 but some junior mold designer still confuse to make layout and construction of cooling in mold. 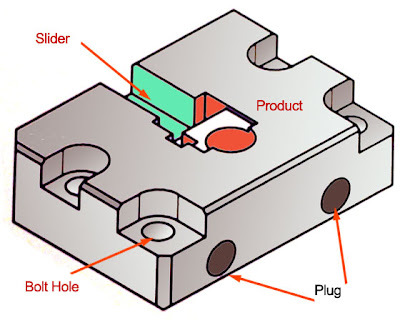 before this posting, i havepost about cooling construction in slider, beside slider mold cavity also important to fill cooling, why because almost product 70-80 % is molded shape in mold cavity. 3. In / Out Hole, it's hole also make using jig bore. this hole will attach in cavity plat that will match with cooling layout in mold base. orange color indicate product insert hole shape. 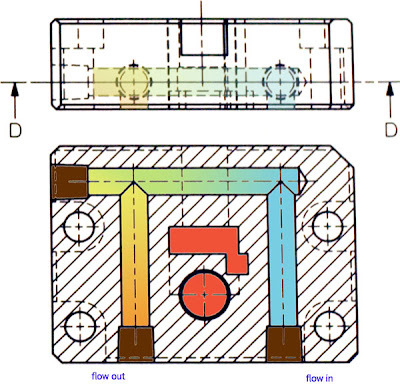 picture above is shown flow of cooling process of cavity mold from top view. at this wireframe method picture, we should make hole at bottom side of core to connected cavity and cooling layout of mold base. 2. choose a good diameter for the hole, like 6 cm, 8 cm, or 10 cm. 3. when injection proses begin make sure using calculation so you have turbulent flow in cooling pipe. 4. make the pipe more long is useful for make turbulent flow. then how the layout and construction of cooling in mold base ?